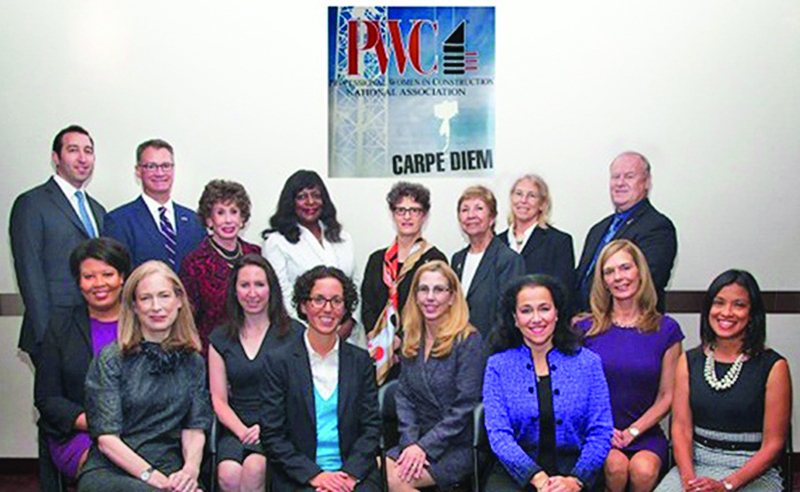 “Our roster grows as more remarkable women achieve excellence and prominence in the industry,” said Lenore Janis, president of Professional Women in Construction (PWC), introducing the honorees at PWC’s annual Salute to Women of Achievement luncheon held October 15 at Club 101 in New York City. Connie DeLaigle, Port Authority of NY & NJ (PANYNJ), was the event chair. Janis paid tribute to the presidents of two of PWC’s chapters, Carolyn Kurth, CPA, CFE, senior manager at CohnReznick, president of PWC-CT and “one of the founders of the first PWC chapter”; and Carolyn Pugaczewski, CIC, CRIS, president of M. Adams & Associates, president of PWC-NJ who “injected life, energy and vigor” into the chapter. Kurth said, “In 2005 we had a vision” and thanked Janis for “her dream and her team” that led the way. L-R Honorees, seated: Nicole Hunter, HNTB; Sylvia Smith, FXFOWLE; Michelle Bernstein, Alexander Wolf & Son; Stephanie Cesario, HRCG; Carolyn Kurth, CohnReznick and PWC-CT; Marianne Egri, NYC SCA; Carolyn Pugaczewski, M. Adams & Assoc. and PWC-NJ; Zaria Demarchi, PANYNJ. L-R Presenters, standing: Peter Bernstein, Alexander Wolf & Son; Phil Collin, HNTB ; Lenore Janis, PWC; Connie DeLaigle, PANYNJ; Ann Rolland, FXFOWLE; Joan Gerner, HRCG; E. Bruce Barrett, NYC SCA; Ed Gould, PANYNJ. Photo by Pearl Perkins. Honoree Marianne Egri, V.P., NYC School Construction Authority (SCA) spoke of the more than 200,000 new student seats the SCA has created since its 1989 inception–when she joined – and thanked the agency for the “great career opportunities” and “the amazing work it has accomplished” for NYC. E. Bruce Barrett, R.A., V.P., NYC SCA called Egri integral to the SCA and commended the goals she set and fulfilled including on-time payment. Peter Bernstein, director of operations, Alexander Wolf & Son, said that his sister is the first female family member to join the company founded in 1905 by their great grandfather. 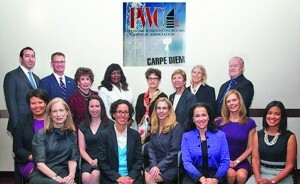 Contact pwc@pwcusa.org, visit www.pwcusa.org/ny or call 212-486-7745.